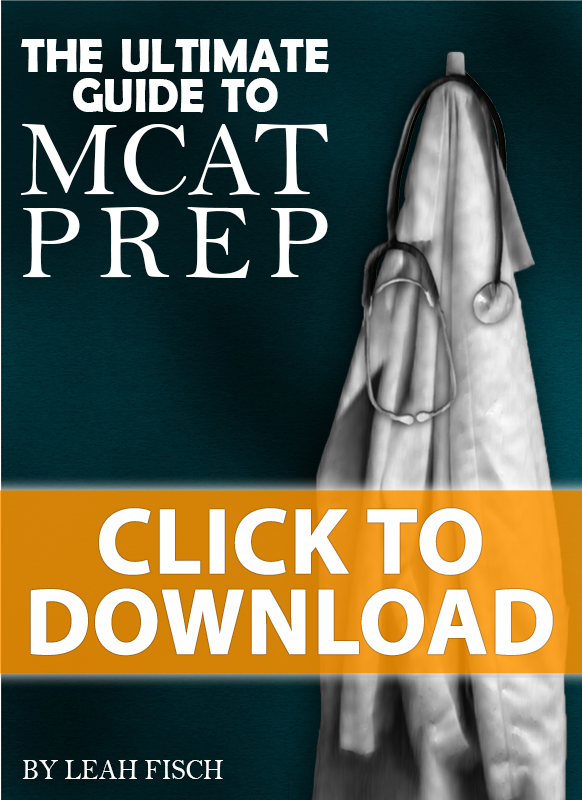 Below is the transcript of my tutorial video MCAT Math Video 6 – Fractions Ratios Percentages and Proportions on the MCAT. 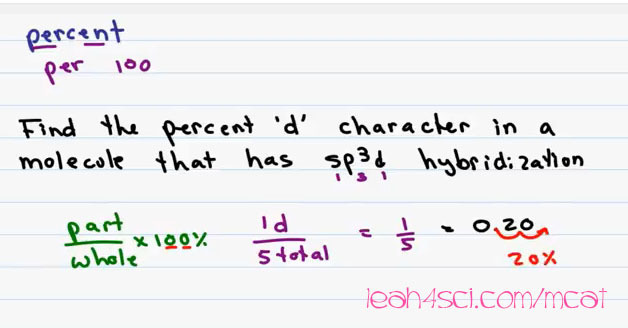 Leah here from leah4sci.com/MCAT and in this video I’ll show you how to solve MCAT style questions involving Fractions, Ratios, Percentages and Proportions without a calculator. The science portion of this question will be tackled on my Chemistry series at leah4sci.com/MCATChemistry but for now let’s focus on the Math. In setting up with this equation we’re trying to find the molarity which is moles per liter (M=mol/L). But we first have to solve for moles and then for liters which results in many different fractions. 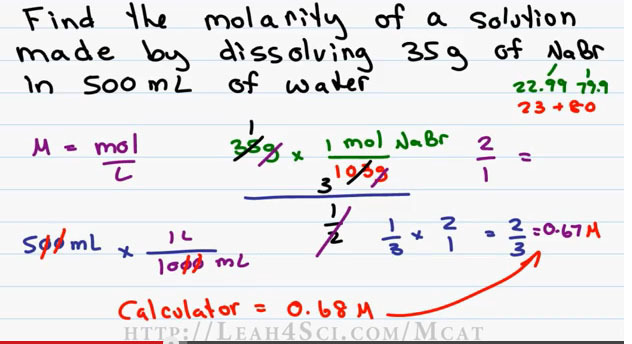 To solve for moles, we set it for dimensional analysis in a form of given times ratio where 35g is the given and we multiply that by 1 mol of NaBr over the molar mass. On the Periodic Table an NaBr is 22.99 for sodium and 79.9 for Bromine. On the MCAT we round that to Twenty Three plus Eighty (23+80). Twenty three and Eighty are much easier to work with and that gives us 103g. Grams cancel giving us a molar value and then we want to divide all that by the volume. We have 500 milliliters times the ratio of 1 liter over one thousand milliliter (500ml x 1L/1000ml). Use the trick in cancelling out zeros, in this case we have five over ten (5/10) or one over two (1/2) and our ultimate calculation is 35 times one over 103 divided by ½. If you have to divide fractions, you multiply by the reciprocal, so we’ll flip one over two to become two over one (1/2 to 2/1) and set it up to solve. The reason I didn’t solve the individual components is because if I have to run through all the equations it’s going to take too long. But if I can find a way to simplify, I’ll save myself the time and save myself of calculations. Thirty five over one o three is approximately a third (1/3) because thirty three over a hundred is one over three. On the MCAT we allowed to round to its close enough and so we’ll divide each one by approximately thirty five so we’ll get one over 3 (1/3). My new simplified equation is, one over three times two over one which is simply two over three (1/3 x 2/1 = 2/3). This is a fraction that you should know which is equal to zero point six seven molar (0.67M). Punching the exact value in the calculator, I get 0.68 molar which on the MCAT is close enough. And how did I save myself from all the Math? I set up one series of Fraction times fraction times fraction following what I can simplify or cancel out leaving me minimum numbers of calculations that I can easily do in my head. Let’s say you do found yourself having to come up with a value of a fraction, I don’t like fractions because they’re hard to put in to longer calculations so I like to turn them to decimals or whole numbers. You should be comfortable with the numerical value of fractions ranging from one over one all the way to one over ten (1/1 – 1/10) and if you’re not comfortable with this, download my Mathcheat sheet on my website http://leah4sci.com/MCATMATH. The first thing you want to do is set up the RATIO. Anytime you’re asked for the percent, solve for the part over whole where the whole is your one hundred value and then you multiply it by one hundred percent (part/whole x 100%). In this case we’re asked for the d character so the d is our part and we only have one d, the whole will be the total number of orbitals that combined upon in this hybrid, in this case we have 1 S, 3 p and 1 d for a total of five (5). I mentioned in an earlier video giving me an answer of twenty percent (20%). If you’re not comfortable with this method, you can also try turning your fraction into a number that is directly divided by a hundred. So let’s show it in this example first. If we have one over five, ask yourself how do I turn a five into ten or into a hundred? I’ll do it step by step but I want you to be able to do this in your head. If we have one over five, to turn five into ten, I need to do five times two so I’ll multiply this by two over two. Because two over two is equal to one so I don’t need to change the identity or the value of the number. One times two is two, five times two is ten. It’s very easy to go from ten to a hundred, I just multiply by ten over ten. Two times ten is twenty, ten times ten is one hundred. Twenty per one hundred is twenty percent (20/100 = 20%) and that gives us twenty percent again. Now for something like this, you don’t want to go through the steps, but what if you’re faced with a fraction such as seven over 33 (7/33). This is a lot more complicated to do if you’ll try to this the long way or try to do this in your head. But if you ask yourself, can I turn thirty three into a hundred, this becomes much easier. Thirty three is a third of a hundred so what I have to do is multiply by three over three (7/33 x 33/33). Seven times three is twenty one, thirty three times three is a hundred and my answer is approximately twenty one percent. What is the gravitational force on a planet if the mass is 3 times the mass of earth but its radius is only 2 times the radius of the earth? I’ll address the Science of this question on my Physics videos which you can find at http://leah4sci.com/MCATPHYSICS . But let’s look at the Math here. 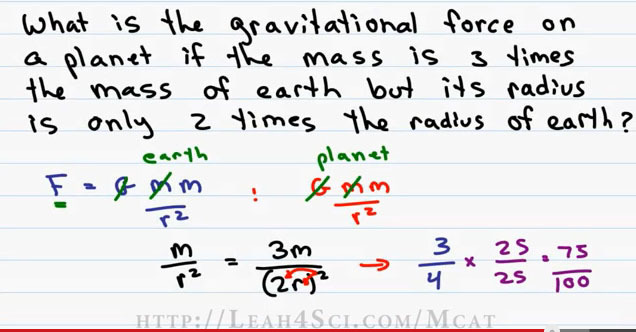 The equation for Gravitational Force is F equals Gmm over r squared (F=Gmm/r^2) where one of the m refers to the mass of the planet the other the mass of an object. What we want to do is compare the two equations. One for the force of earth and one for the force for a planet, we’ll put that in different color, we have G mm over r squared (G mm/r^2). Now we’re setting up a proportionality. Anything that shows up the same on both, meaning if we have a value that is the same on both sides of the proportion, we can cross it out. The first mass refers to the mass of an object, get rid of it, the G value, we’re not looking at, so get rid of that. We’re solving for Force over solving for the new force value. So what we’re left with is m over r squared and we’ll assume that the mass of earth is considered one and therefore the mass of the planet is three because it’s three times the one mass of earth. The radius of the planet is two times that of the radius of earth so our earth is going to be one and here’s how we set it up. The new m over r squared is equal to the following: mass of the planet three times mass of earth, radius of the planet is two times the radius of earth, remember that we have to square it so the square is going to square both the two and the r and this gives us a new value of three over four because two squared is four and that means the gravitational force on this new planet will be three over four (3/4) which is seventy five percent. Now let’s use the trick above to prove that it’s seventy five percent. Three over four, you should recognize one over four is point two five multiply that by three point seven five or you can say that to fo from four to a hundred is times twenty five over twenty five. Three times twenty five is seventy five, four times twenty five is one hundred and that is seventy five percent that of the force of earth. Be sure to join me in my next video where I show you how to solve MCAT style Trigonometry Angle and Vector style problems without a calculator. 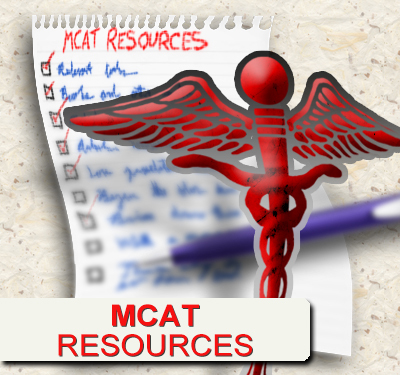 Are you stuck on a specific MCAT topic? I offer Private Online Tutoring where I focus on your needs to strengthen your individual weaknesses. Tutoring details can be found using the link below or by visiting my website http://leah4sci.com/MCATTutor. 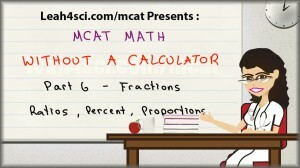 Watch MCAT Math Video 6 – Fractions Ratios Percentages and Proportions on the MCAT.